Constructed using commercial quality materials and manufactured in the UK, the Carlsberg features a limited edition cloth design. It's a professional table that has been designed with a slimmer cabinet depth and a hinged "lift off" top frame, which enables it to be installed into places where a standard table cannot. A superb home slate bed pool table featuring the world famous Carlsberg logo - the Carlsberg table combines commercial standard build quality with a slim design cabinet that is just 9 inches deep. The shallow body has been designed with the homeowner in mind, and not only gives the Carlsberg table a sleek, modern feel, it also makes delivery into rooms with tighter access easier. The Carlsberg has a cool matte black finish on the body of the table with aluminium trims, and a cool, refreshing green or black cloth featuring an authentic Carlsberg logo (see below). The Carlsberg table - probably one of the best home tables in the world! The World Famous Carlsberg Logo - Your Pool Table will feature a logo exactly as it appears on the label! When choosing your pool table it is important to consider the size of the room or site you wish to place it in. It is recommended that there is enough room to fully extend your pool cue from the edge of the table to the walls of the room. 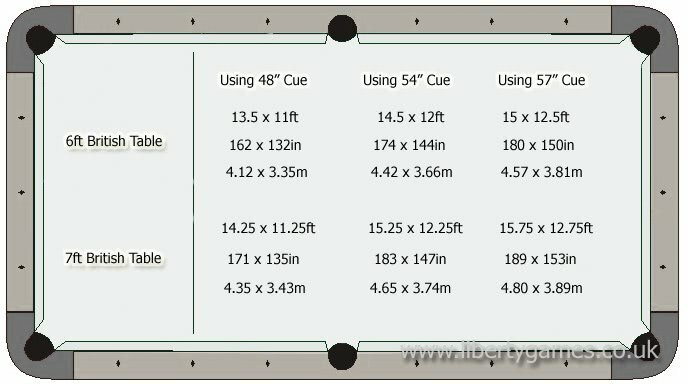 The dimensions below are ideal sizes, however if space is a bit tight why not also purchase a "Junior" or half-size cue to help with any tricky tight angles. The Carlsberg slate bed pool table is bespoke built to order depending on your choice of table size, finish and cloth colour in a UK-based factory - a process resulting in a 4 to 6 week delivery time. You can choose to have your table delivered for self-assembly or delivered and installed. 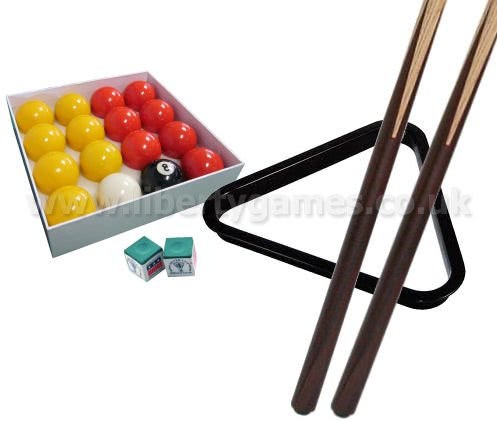 We use a dedicated firm who have years of experience moving and installing pool tables. For more details please see the Delivery Information below. Slate Bed Pool Tables are built to order in UK based factories. This process can take between 4-6 weeks depending on the model (please refer to product listing for more information). Once the table is ready it will be collected by our courier and delivered to the customer within the following 5 to 10 working days. Please note that delivery times may be extended for areas in the North East, Scotland, Cornwall and Devon. Free delivery is to UK mainland only - a surcharge applies for these postcodes: AB, DD, FK, IV, KW, KY, PA, PH. please contact Liberty Games for a shipping quote to the Scottish Highlands, Ireland, Northern Ireland, GB Islands and overseas before placing your order. Please contact Liberty Games for shipping costs to areas north of Glasgow and overseas before placing your order.